Goodness, I think I remember seeing FUDGE advertised or reviewed in Dragon Magazine years ago! I'll have to sift through those old mags to check, but what a flood of memories this post just triggered! You're welcome, JM. I often find it remarkable how long some games have been around. I can only urge you to check out Fudge once more, there's a lot more to it these days! I like Fudge but it seems to attract people who like to fiddle with rules more than it attracts people who actually play. I think part of this is the presentation. Instad of "These are the rules." It's more "You can do this, you cna do that, or maybe both, or a third option." which gives it an unfinished feel. For people who want to grab a game and start playing, Fudge is not among the top choices. That's a very interesting point, Stan. I had not considered the culture that surrounds the game and the affect of its presentation on that culture. I'll make a note to consider that in the future. I think all generic systems have an element of attracting fiddlers to some degree. Perhaps phraseology in Fudge might help in bedding it down in the real world. I think the same could be justly said about d20 at the start. Where free generic systems really get their flavour is in the setting. 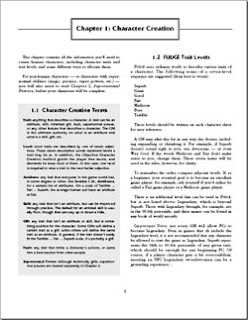 It is the setting that makes it runnable. The setting in these cases are much like the glue. It's certainly true for Yags and Jags (review soon). To extend your point further, do you think that presentation-for-tinkerers is indicative of games released under open licenses? The books are trying to snag people into extending and getting involved in the open gaming projects and to do that the presentation needs to be different from a "closed source game". I'd agree with you that it's not necessarily the best way of delivering a game whose sole purpose is to be played. I'm not sure about the open license and tinkerer relationship. I haven't thought about it much but I've noticed it on the little time I've spent on Fudge forums. To use a totally different analogy, you know how there are artists in most fields who are not generally known except that they are admired by other artists? They're sort of an artist for artists instead of the public. I feel like Fudge is appreciated by GMs but not so much by players at large. I'm not sure why. Maybe it's the elegance of the mechanics but without lots of the character generation toys players like to play with. This might be why it has a long standing fan base but it has never been a popular game. I like the concept of fudge dice because it gives you a mean centered on the ability level with roughly normal variation around it. Well said Stan and I couldn't have written it bette myself. I've just always felt that Fudge was a good 'skill system' with the rest just 'tacked' on. 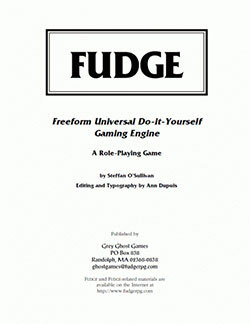 At best, I think Fudge is an "RPG Creation Toolkit" rather than an actual RPG.